(Newser) – Sarah Palin's Alaska hometown is auctioning an SUV she drove when she was mayor, years before she skyrocketed to fame. 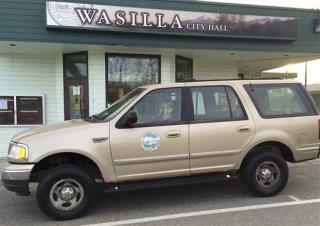 The small town of Wasilla listed the 1999 Ford Expedition with 74,188 miles on eBay Monday with a minimum bid of $10,000. The listing's photo shows the tan SUV with a cardboard cutout of Palin in the driver's seat. A 1999 Ford Expedition in excellent condition at that mileage has a Kelley Blue Book value of $2,318 in the Wasilla area. But city officials are hoping Palin's role in history will bring out fans willing to pay a lot more. Using her likeness to sell the SUV, she'll want her cut.